The Apple Watch is an elegant piece of kit, but the charger that Apple sells you with the watch has a 6 meter, rather stiff cable going to the little magnetic puck. Since the cable is stiff, the puck kept flipping upside down so the magnet wasn’t face up. The puck is also white on both sides so you really have to inspect it closely to be sure you’ve got the right side up. The only way to tell if you don’t have your glasses on is to set the watch on it and wait to see the bright green charger symbol. I figured there had to be a more elegant solution. I bought the Spigen Apple Watch stand to see if it would fix these problems for me. The Spigen stand is a curved piece of brushed aluminum that is very Apple-like. 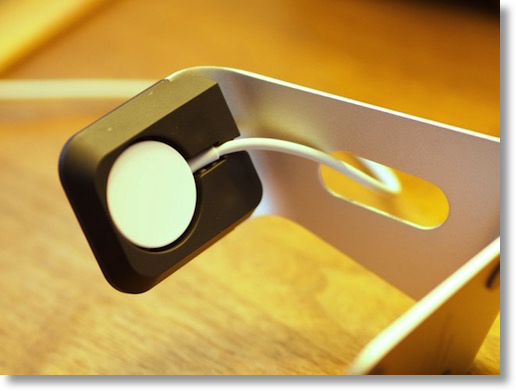 It captures the magnetic charging puck in a black rubber gasket material. That makes it hold the puck firmly in place but it’s very easy to take in and out. There’s a slot in the gasket to firmly hold the cable so that it can fit nicely through a slot in the side piece of the aluminum stand. They were brilliant on the slot making it big enough to fit either the usb end or the puck end through it for easy removal. The stand holds the watch at a pleasing angle of about 45° so you can see it from above or across from the watch. That makes it perfect as a desk stand or a night table stand. 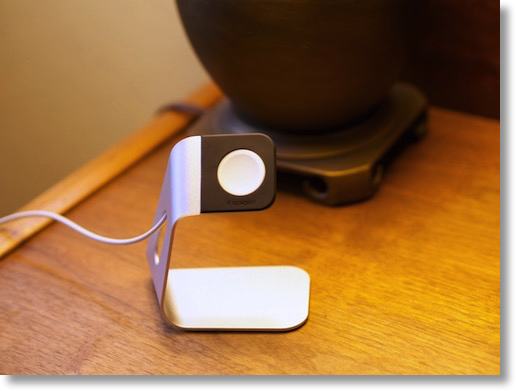 The watch band easily drapes over the top and underneath the stand without any fiddling. 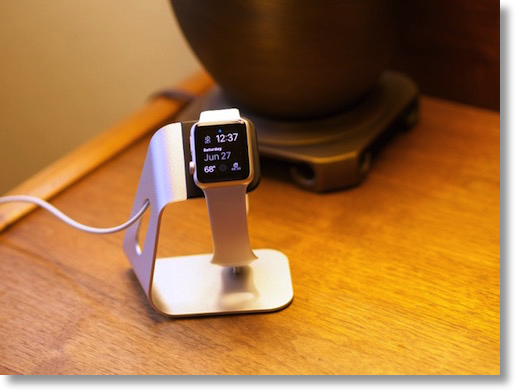 It holds the watch firmly if you lay it on sideways which means it would work for the new nightstand mode coming in watchOS 2. If I have any complaint about the Spigen is that it’s not heavy enough. Great to be light if you want to carry it on travel, but the charging cable pulling on it makes it hard to keep exactly where you want it and at the angle you want it. It’s not a huge downside but a bit more heft to the stand would be a welcome change. The Spigen Apple Watch stand is $19 at Amazon. I put some photos of the stand in the shownotes so you can see how it looks. I put a small square of velcro on the back of the puck and the opposite square of velcro on top of my iHome. That holds the charger in place on my night stand in the correct orientation. Then I just place the watch on it nightly and the phone on the iHome charger. This will also allow me to easily remove the charging cable if I need to take it with me somewhere. Actually you can’t really notice. You don’t see the Velcro. The puck is just sitting on the open space of the ihome not sliding off the night stand. Ah, I see what you’re saying. I pictured it when you take the charger with you on vacation leaving behind the velcro. Donald Burr wrote a comment on the podcast post that since the Spigen is light, he hot glued some fishing weights to it – so THAT sounds real attractive! I bought one of those stands that you reviewed today. It was so so in my opinion. Mostly I thought it was way too light in the base and it made me nervous so I looked for something different and found this one by Navitech. Yup, it is about $8 more but I think it is so much better. Love your show, as always.